Click Here. Double your traffic. Get Vendio Gallery - Now FREE! 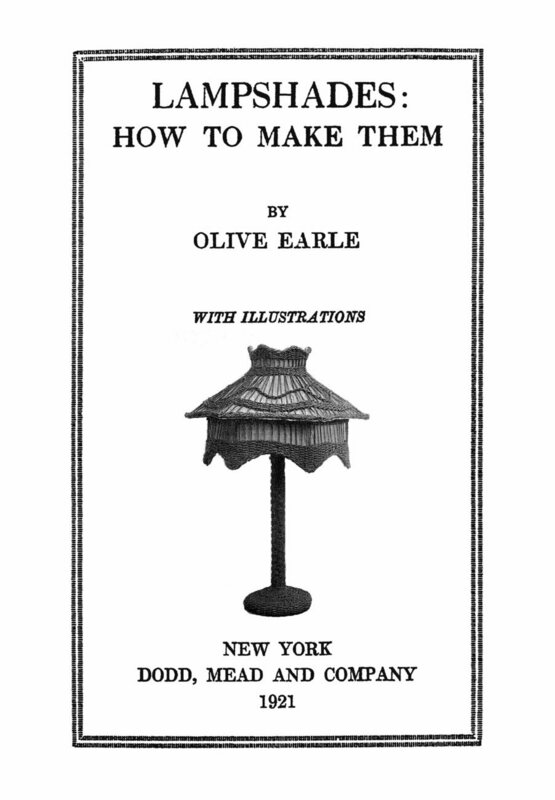 Payment Shipping Additional Information Lampshades Book Make Flapper Lamp Shades How to 1921 Click to View Image Album Lampshades and How to Make Them: With Illustrations Spiral Bound Book RepublicationÂ Originally published in 1921! Why Buy Just One? Receive a 50% s/h discount on all items in your order after the first purchase, providing all are paid for in a single payment as invoiced! If you are the first to bid on thissale, using the buy-it-now option, YOU WIN! There' s no chance of being outbid! DON'T WAIT! Up for bid is another marvelous Dakota Prairie Treasures Spiral Bound Book RepublicationÂ of the original "Lampshades How to Make Them" guide! This item includes many images, line drawings and instructions showing the Flapper Era art of making your own, custom-made lampshades! Originally published in 1921! (Original is NOT for sale) Our new line of Spiral Bound Book RepublicationsÂ oh-so-conveniently lie flat while in use! This is a unbelievably nice touch if you have every tried to read a pattern's instructions while your hands are full of your in progress project. As an avid needleworker myself my personal experience prompted my choice of spiral binding for it's ease-of-use alone. I bet you'll love it too! This item is a great resource for those who are WWI, Titanic and Flapper era historical reenactment enthusiasts, students of historical fiber and textile arts, etc! Our customers say: "Wonderful book, fast shipping, Thanks so much." "FANTASTIC BOOKS AND EVEN MORE FANTASTIC SHIPPING! THANK YOU EVER SO MUCH!!!" This HISTORIC item photos, line drawings, instructions, designs, materials and fundamentals for creating a variety of household lampshade items. There are many different types of lampshade styles and designs with significant cultural and historical instructions included! This type of original bibliomaniacal searching to run across this gem and am sharing with those who love the old arts as much as I!!! These instructions are characteristic of the elegant and genteel art and craft projects our lady ancestors turned their hands to during the Flapper period and earlier! This is the perfect opportunity to purchase your own version of another wonderful creative art informational source revealing our heritage from early America and European! An excerpt: "The purpose of this book is to make the art of shading lamps and candles a little less of a problem to the amateur craftsman; and it is hoped, also, that those who have already had some experience as shade makers, will find some practical hints that will be of value to them... ...With patience, careful workmanship and good taste, as fine a lampshade as money can buy, can be produced at a fraction of the cost of those offered in the stores." What a historically educational and delightful art instructional piece this is! Contents: Chapter 1: PLANNING THE LAMPSHADE Chapter 2: CANDLE SHADES AND FRAMELESS LAMPSHADES Chapter 3: BINDING AND LINING FRAMES Chapter 4: FABRIC SHADES Chapter 5: DECORATED SHADES Chapter 6: SHADES FOR SIDE LIGHTS AND OVERHEAD FIXTURES Chapter 7: PAPER SHADES Chapter 8: TRIMMING, FRINGE AND ACCESSORIES Chapter 9: SHADES FOR CHILDREN TO MAKE The ladies of earlier times put their hands to such marvelous work and now you can too! These are beautiful items and sure to delight you and yours! The instructions are based within the parimeters of the Victorian grammatical and socialization culture. For those who have some experience with that era's verbal and text style the instructions should be clear and easy to follow. The experience wax worker will be capable of altering as per individual needs and artistic whim. You will appreciate the attention taken in providing a TOP QUALITY PRODUCT that you will use for many years to come...and can participate in reviving an almost dead art of wax flower making! The ladies of earlier times put their hands to such marvelous work and now you can too! These are beautiful items and sure to delight you and yours! These instructions are very clear and easy to follow and yet the experience needleworker will be capable of altering as per individual needs and artistic whim. You will appreciate the attention taken in providing a TOP QUALITY PRODUCT that you will use for many years to come. This information has been scanned at a high resolution and electronically revamped to provide you with the very best hardcopy reproduction. Unlike other reproduction sellers this is NOT a cheap, grainy photocopy! Our Spiral Bound RepublicationÂ has so many more advantages over the original book. What are the benefits of our antique book Spiral Bound Book RepublicationsÂ? * Our products are produced with front and back covers of heavy stock paper. * Our products are made using the latest LaserJet printing technology meaning the ink will not smear like inferior photocopy or inkjet products do. * Our spiral binding allows your book to lie flat during use for ease of viewing while working on your projects. * Our products do not cost a small fortune for you to obtain and enjoy. * Every image and every page has been scanned to produce crystal clear images and you never have to deal with any crumbling old paper! * These scans are enlarged to full-page dimensions for ease of viewing! * You can gift these wonderful Flapper Era craft guides to family and friends! *Each item is shipped with extra packing materials to prevent it being folded or bent while traveling through the postal system! Curious about the quality of this item? Please contact me and I will forward an image for your own personal inspection! You will appreciate the attention we have taken in providing you with a TOP QUALITY PRODUCT that will be use for many years to come... Check out Dakota Prairie Treasures' currentsales for many other unique needlework CD Spiral Bound Book RepublicationsÂ for your creative needle working pleasure! Payment: Paypal only as per new (10-2008) seller regulations. Shipping: Within the USA: 4.95 via USPS. Out-of-country destinations (Canada included): 12.95. International buyers are responsible for their country's custom duties. We do not mark merchandise shipments as "gift" on the USPS Customs form. Combined shipping is available for all Dakota Prairiesales ending within 48 hours. A 50% s/h discount will be automatically applied to each item after the first purchase in all combined orders. Copyright Restrictions: All sources utilized in producing Dakota Prairie Treasures' Copyrighted Republication Products originate from public domain works. However, all text, images and trademarks contained within our Republication Products (and listing descriptions) are our creative property and copyrighted solely to Dakota Prairie Treasures. All Rights Reserved. No resale rights apply. You are permitted to use our product's information for items you make for yourself or for gifts. However, our products text, designs and images remain the exclusive legal property of Dakota Prairie Treasures. Our products contents may not be reproduced, used in class lessons or duplicated in any media or electronic format to be resold or "shared" (either individually or as a package or kit) without our prior written consent. Any and all violations will be prosecuted to the full extent of the law. Returns allowed due to manufacturing defects only. Payment Back to Top I accept the following forms of payment: PayPal Shipping Handling Back to Top Why Buy Just One? Receive a 50% shipping/handling discount on all items in your order after the 1st purchase, providing all are paid for in a single payment as invoiced! Payment: Paypal only as per new (10-2008) seller regulations. Please visit our othersales store listings for more items of similar interest! US Shipping 4.00 USPS Media MailÂ 4.95 USPS First-Class MailÂ International Shipping 12.95 USPS First-Class Mail International Additional Information Back to Top FREE scheduling, supersized images and templates. Get Vendio Sales Manager. Make your listings stand out with FREE Vendio custom templates! FREE scheduling, supersized images and templates. Get Vendio Sales Manager.